How much chauvinism do female police officers face? 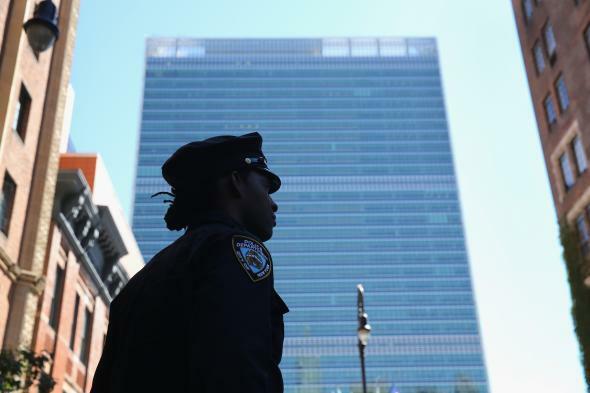 A police officer stands guard near the United Nations headquarters in 2013 in New York City. Law enforcement has improved with regard to the way women are treated in the workplace as compared to the 1960s, when the first women entered mainstream policing. Some of the first female patrol officers were required to wear skirts and pump-type shoes and carried their firearms in a shoulder bag. Prior to that, women were mainly relegated to investigations involving children and handing of female prisoners. There are now women at all levels of law enforcement, and they have shown themselves to be just as capable as the men in every regard. Women have a disadvantage over men in traditional patrol work, as they are typically of smaller stature and inferior upper body strength. It’s difficult enough for male officers to grapple with combative suspects; it’s even more so for a woman who has less physical strength. Women excel over men in fine motor control under stress. Given proper instruction, they generally shoot better than their male colleagues. Women also tend to have better verbal skills and are less driven by ego, so every confrontation doesn’t become a battle of wills. Women are better at talking their way out of bad situations, where men will resort to force more easily. These trade-offs have not helped much in eliminating the prejudices that women face in the police workplace. The insults and derogatory labels that are used are different from those applied to other minority groups, but they have the same effect and stem from the same irrational biases. Women in law enforcement are also at a huge disadvantage with regard to their social lives. An unattached female police officer all but severs her social prospects with nonpolice men. Not many men are secure enough to date a woman who carries a gun and represents such an authority figure unless they are in a similar role. I’ve known quite a few pairings that consisted of a female officer and a male noncop. Exactly two of them survived more than a year. What happens if you rear end a police car or vice versa? Is it better not to take a breathalyzer test? What would police officers like to see put in place of the D.A.R.E. program?